The University of Michigan has selected Beynon Sports for the construction of their new indoor hydraulic track and outdoor track surface. The University of Michigan’s $168 million South Campus Competition and Performance Project is taking shape. Once completed, the facility will occupy approximately 310,000 square feet and will be the home of UM’s men’s and women’s track and field, cross country, lacrosse, rowing and soccer teams. The University of Michigan’s indoor facility will showcase Beynon’s Rise’N’Run Hydraulic Track. Beynon’s Rise’N’Run Hydraulic Track allows athletes to raise and lower the track surface to specific angles of embankment to counteract centrifugal force caused by their circular motion and achieve unparalleled racing times. The outdoor track at Ferry Field will also be constructed by Beynon Sports and feature Beynon’s BSS 1000 track surface. Known for being as good (if not better) on race day as it is for training, the BSS 1000 track surface is the same sports surface installed at high profile track and field venues in Michigan such as Grand Valley State University, Oakland University, Western Michigan University, and over 300 other esteemed NCAA and elite high school facilities across North America. With both harsh winters and hot summers, the BSS 1000 track surface is perfect for the roughest weather Michigan has to offer. 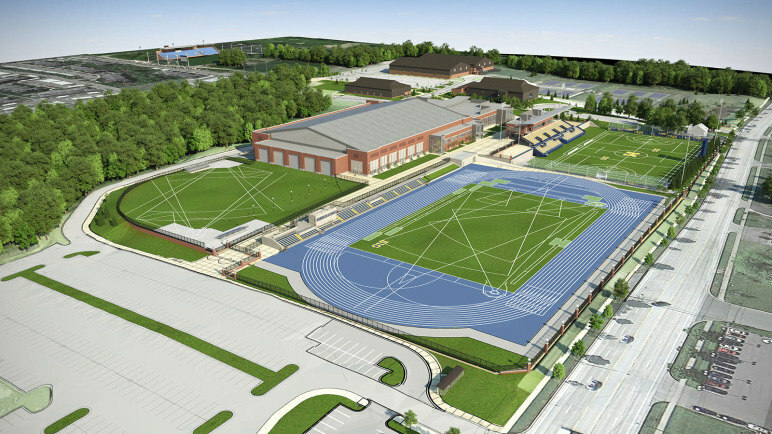 The new Beynon indoor track and outdoor track and field facilities will accommodate 2,000 and 500 spectators, respectively, and allow the University of Michigan to once again host home track meets as well as regional and national competitions. It will arguably be one of the best track and field facilities in the country. The University of Michigan, a longtime partner of Tarkett Sports, is continuing the tradition with these two new Beynon track surfaces. Currently, 5 FieldTurf artificial turf fields are installed on Michigan’s campus – Michigan Stadium, Oosterbaan Field House, Al Glick Field House, an outdoor practice field and a recreational field. Last winter, the University of Michigan’s indoor track building received another new Beynon running surface. Despite being faced with a tight deadline, the Indoor Track was completed on time to ensure the Wolverines didn’t miss a beat. With their best indoor conference finish in years, the track proved to pay off.